Alcatraz, the former military fort and notorious maximum-security federal prison that housed the likes of Al Capone and Machine Gun Kelly, and the site of the Indian “Red River Movement” and Occupation from 1969-1971, offers visitors an up and close glimpse of life on Alcatraz Island. In addition to the historical importance of Alcatraz, visitors can view the gardens, bay views, and birds nesting. Your trip to Alcatraz departs from Pier 33. The ferry across takes approximately 10-15 minutes. A National Park Ranger will give a brief welcome and orientation when you arrive. A brief video at the theatre will give you an overview before embarking on your tour. On your way to the Cell house there will be several exhibits to view and buildings that were used by the prison. You can also walk along the Agave trail. The Agave trail gives visitors up and close views of the protected bird sanctuary and gardens of the island. 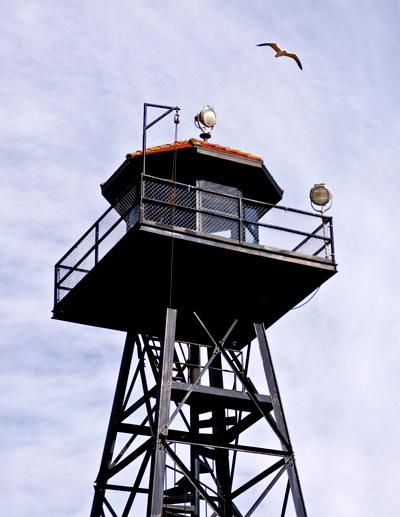 The Alcatraz lighthouse was the first west coast lighthouse. A single oil lamp lit the narrow entrance to the bay. Until the invention of electricity, the lighthouse was manually lit. The lighthouse was replaced in 1909 when the construction of the cell house blocked the view. The new 84foot lighthouse tower is what you see today. The sandstone rock of Alcatraz Island was changed by Military and Prison personnel into a garden of beauty. When the prison closed in 1964, the gardens became overgrown. Today, with the help of volunteers, the gardens of Alcatraz have come back to life. Island Walks and Bird Viewing. The best views can be seen following the Agave Trail (open during the months of October thru February) The view of rocky cliffs, western gull nests, exotic flowers and trees can be seen on your walk around Alcatraz. The Barracks Building above the Alcatraz Dock, exhibits and video presentation, and books about Alcatraz are available. The bookstore is at dock level and museum in former kitchen of the cell house.